Lustrous, understated beauty abounds in this collection of near white daylilies that will bloom throughout the season in your garden. The package includes early, mid-season, late season, and reblooming varieties! 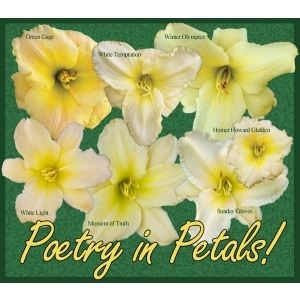 You will receive 2 fans of each of the following seven daylilies for a total of 14 fans: Green Gage, Winter Olympics, White Temptation, White Light, Moment of Truth, Homer Howard Glidden, and Sunday Gloves. These near white daylilies (some are even more true white than they appear in our photos) are a fabulous addition to a white garden and when they catch the moonlight you'll be enchanted! Don't wait to order as this collection is limited to the plants in the field!